We pick you up at your arrival at the airport in Fes or at the door of your accommodation at the agreed time. We will leave Fes direction Ifran, known as the Switzerland of Morocco located in the middle atlas. We will continue our way to the desert, knowing the legendary forest of Cedros de Azrou and its curious inhabitants (monkeys). We will continue until we reach Midelt where we will stay. After breakfast we leave for Merzouga (desert). We will leave Midelt crossing the mountains of Tizi N'Tlghomt, we arrive at the Errachidia reservoir and the magnificent panorama of the Ziz valley, full of palm trees and Berber adobe villages. Arrival in Erfoud this city is built as one of the most important oases in Morocco. 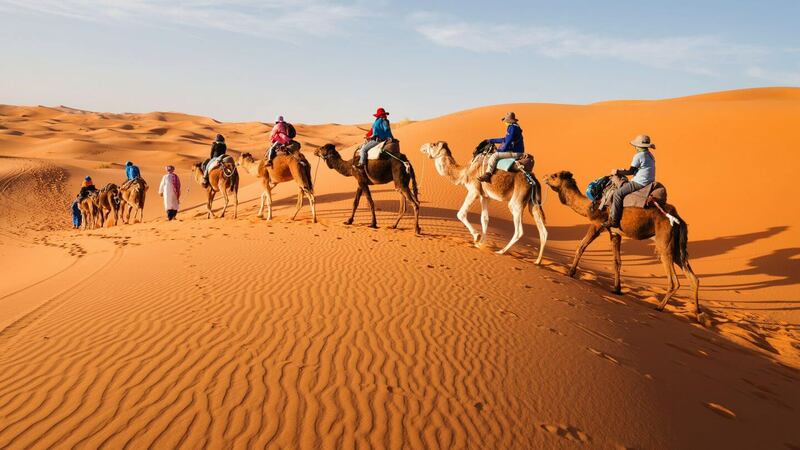 Then we will continue our way to the Erg-Chebbi desert of Merzouga, where our hotel La Source is located. Dinner and overnight at La Source. You are already in the desert! ... enjoying the magic of the dunes. In the morning we take the 4 × 4 and we will know these lands: We will go to the home of a family of Gnawa musicians, descendants of the slaves who came from Black Africa, and who will delight us with their traditional music. We will enter the dunes, where the Paris - Dakar passed. We will meet some nomadic families that live in that sea of sand and stone ... An authentic adventure !! ... We return to the hotel and leave the 4 × 4 there, because in the afternoon we will ride the 8 × 8 (are the camels) that will take us to the heart of the desert where we will contemplate an unforgettable sunset. Dinner and accommodation in Haimas in the middle of the desert. We will get up early to admire the sunrise between the dunes. We will return to our hotel La Source and after a good breakfast, and a refreshing shower, we take the 4 × 4 and we will go to Rissani, which is another of the Imperial Cities of Morocco, to visit its legendary market (if it matches the date of your trip) and the ancient city of Sijilmassa, was one of the bases of the old caravans that crossed the Sahara towards Timbuktu, from which you can still appreciate its ruins. It was taken by the Almoravids in 1055 before the capture of Marrakech, which would start the dynasty that ruled Morocco until 1144., we will also approach Erfoud, where we will visit a workshop where they work with fossils, and at whatever time you think We will pick up and return to our Hotel La Source, where we will prepare an exquisite dinner and where we will lodge you. We will get up early to admire the sunrise between the dunes, we will return to our hotel La Source and after a good breakfast and a restorative shower, we will return to Fes. We will leave you at the RIAD where you have booked your accommodation and the end of our services.